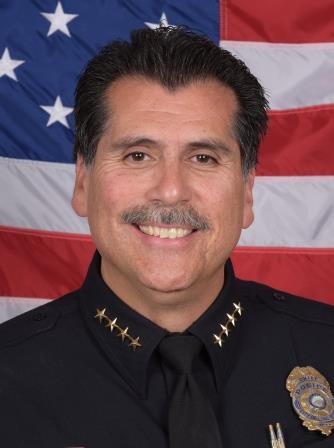 Robert Luna was appointed as the 26th Chief of Police for the Long Beach Police Department in November 2014. Chief Luna has served the City of Long Beach, the second largest city in Los Angeles County, for 29 years. His distinct work history includes a number of operational, investigatory, and administrative assignments, including Special Weapons and Tactics (SWAT), homicide, drug, and gang investigations, canine operations, and communications. preparedness, terrorism considerations, critical incident management, and the development of effective problem solving strategies in accordance with proven Community Oriented Public Safety and Governance philosophies. Chief Luna is immersed in the diverse ethnic, educational, recreational, and business communities that distinguish the City of Long Beach. He especially enjoys those opportunities where he is able to volunteer his services or mentor youth in the importance of education, a strong work ethic, and personal responsibility. His crime prevention and reduction ideas, coupled with his bilingual abilities and dedication to public service have given him the opportunity to effectively interact and participate with a uniquely engaged community. Chief Luna has been instrumental in helping to build and maintain productive and trustworthy relationships between the police department and the community it proudly serves. Renowned community groups, such as the National Association for the Advancement of Colored People (NAACP), the Community Hispanic Association, and the California Conference for Equality and Justice (CCEJ) have formally recognized Chief Luna’s accomplishments.